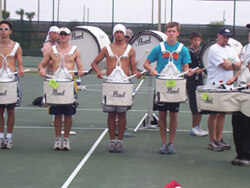 Scherzo is a new DCI.org column by Eric Fox, a front ensemble player with the Magic of Orlando. Fox will report back from each spring camp, and continue his reports through the summer. Nothing beats Florida in the month of March. While many corps are still bunched up inside high school gyms and field houses due to cold weather and/or snow, the Magic of Orlando took advantage of the hot and breezy weather of Florida and took its rehearsals outside. The weather couldn't have been better, well except for the extremely strong winds. As most people know, music stands and sheet music don't get along with wind very well. Florida's March weather was almost perfect for the Magic of Orlando. While outside, the corps learned some practice drill to prepare themselves for drill they'll be learning at the second March camp later on in the month. Of course, while the horn line and battery were outside dealing with the sun and heat, the front ensemble practiced inside in the air-conditioned band room. Just by walking around during meals and after rehearsal, it was quite obvious that the horn line and drum line had been outside the majority of the day. Red, burned skin and aloe could be found at every turn. Pit members could easily be picked out of the crowd at this time, they tended to be the few that were still fully clothed and showed no signs of wear and tear from the sun. Problems with the permanently-turned-on lights in the gym were an issue -- it tends to get annoying when you're trying to sleep under them. Members were given the opportunity to move into the cafeteria to avoid sleeping under the gym lights. While only about half the corps moved into the cafeteria, the other half remained under the lights, but it wasn't unusual to see people sleeping with towels or shirts over their faces to block out the light. I came prepared this time, and brought my sleeping mask that my entire corps received last year from a fan in San Antonio. Uniforms were finally fitted to all the members this weekend as well. For the fourth straight year in a row, size 38R for me. Unfortunately, and embarrassingly enough, it'll be my second year in a row having to wear a female version of the uniform. There's really no difference from the male to female versions, but it sure does fit a little more snug than my uniforms in the past. It was nice putting on a different uniform though, it'll be the fourth different uniform that I've worn in my four years of drum corps, and I'm really glad to be back in black pants and shoes, because trying to keep white clean isn't very fun. Camp came to a conclusion with the horn line and entire percussion section ensembling out in the sun. Half the show was played through as a full ensemble for the first time. Everything sounds great right now from the front; fortunately an advantage to being in the front ensemble is being able to hear everything on the field. Afterwards was a quick wrap-up about camp with Magic director Dennis Cappello, and he spoke with us about the happenings of the second march camp. Once the corps was called to attention and finally dismissed to take care of their chores, it meant it was time to load the truck. Loading the truck definitely isn't the most fun job for anyone. One payback for not having to march (as a pit member) definitely has to be loading the truck. The corps was dismissed around 3 p.m., while the pit was still there loading until about 4 p.m. If only trucks could load themselves, but if that were the case, then I'd expect a whole lot more of people to turn in their marching shoes for a pair of mallets. Eric Fox, 19, is sophomore at Florida State University. He played in the front ensemble of the Tampa Bay Thunder 2000 and 2001, and with the Phantom Regiment 2002, and will play with the Magic of Orlando in 2003. Send him e-mail at friceox@aol.com.